FLIP THE 49TH: Town Hall this week on the Federal Budget! Help us pressure Issa to attend the Town Hall on October 17! 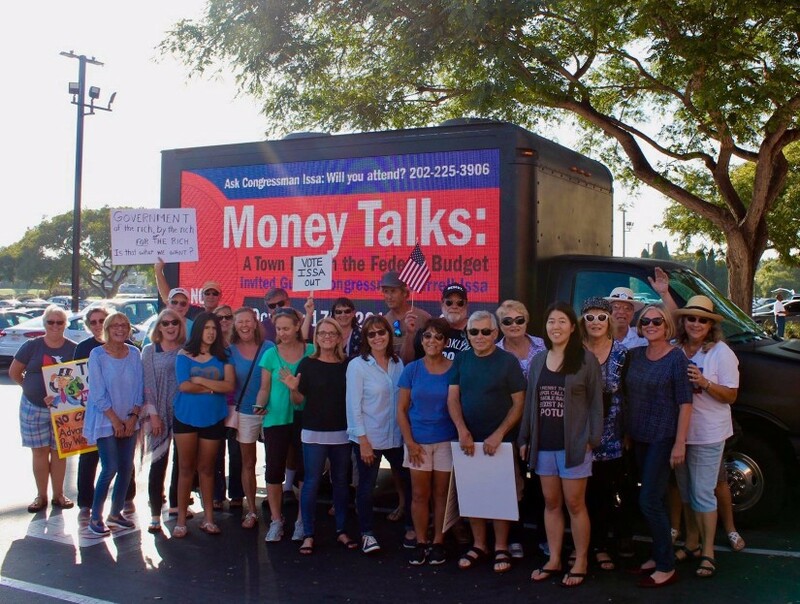 As of Saturday, Issa hadn't responded to our invite, so we turned up the heat with a mobile billboard truck driving through District 49. You can help by posting the photo on social media. Use #darrellissa and #townhall so media (especially Rachel Maddow!) can find them! Maddie is still collecting letters on social justice issues to bring to Issa in D.C. in November. Click here for more information. Tuesday, October 17, 10:00 a.m.: Weekly Rally at Issa's Vista Office - It's a Bird, It's a Plane, It's the Resistance! Are you angry about the proposed GOP tax cuts for large corporations and the super-wealthy? And about Trump gutting the ACA? Then join us Tuesday! Our very own 20-foot Trump chicken makes its debut this week. And we'll have a banner plane flying overhead with a message for Issa. Please RSVP here. Please join us to find out how the GOP Federal Budget Proposal will affect our community and how to fight back! Invited guest: Darrell Issa. Please click here to RSVP. Join us to declare #NoMuslimBanEver. Bring your signs, your voice, and your growing commitment to fight against these discriminatory, unconstitutional, and inhumane bans. RSVP here. At the San Diego County Democrats for Environmental Action October meeting, hear from all three Democratic candidates running to face off against Darrell Issa. More info and RSVP here. At the corner of El Camino Real and Encinitas Blvd. Please join our lively weekly protest and show your support! For more information, check encinitasunity.com. We're looking forward to getting the members together again for updates and breakout sessions. RSVP here. The House is not in session this week. UPDATE ON THE ACA: Indeed, it is true. The jackass in the White House took two steps to destabilize the ACA last week. He pulled the federal subsidies out from under the ACA. This means that everyone’s prices are going to go up. He also signed an executive order that makes it possible to buy a plan that does not have to follow ACA rules and is cheaper. SO, here’s the deal. Covered CA is suggesting that you compare plans within Covered CA AND that you also check around to see if you can buy a cheaper health plan directly through insurance companies that cover your health care system. The renewal period has begun for Covered CA BUT open enrollment for individual plans outside of Covered CA does not start until Nov 1st for many plans. So, you won’t be able to compare prices untill then. October 17 Town Hall: Join us, and post widely on social media to get media attention and put pressure on Issa to attend the October 17 Town Hall. Support Maddie's project by sending her letters about the social justice issues you want Issa to address. Click here for more information. CALL Issa's Office: Let him know what you think and want. Ask Issa to attend the Town Hall on October 17. Tell him how you feel about the proposed GOP budget plan. Tell him we see what Trump is doing to the ACA and will hold the GOP accountable. Our leadership team funded the mobile billboard truck themselves, and would appreciate any additional support you can provide through donations. This Pop-up Protest on Health Care made the local news this week on KUSI. UCSD students and veterans rallied against Donald Trump's executive order that guts important and crucial aspects of the ACA. They also called out Rep. Darrell Issa's voting record to sabotage health care coverage for his constituents.